Campese Ma’afu says the Saints supporters gave him an edge on his debut for the club. The Fiji prop, brother of former Northampton player Salesi Ma’afu, came off the bench in Sunday’s win against Harlequins. It was a special moment for the 31-year-old, who had watched Salesi turn out for Saints at the Gardens on a number of occasions. And Campese relished experiencing playing in front of a packed stadium, with the supporters giving him a warm welcome in the 29-23 success. 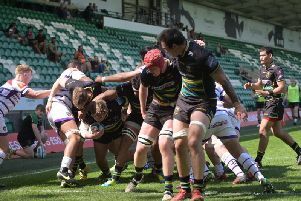 “It was a great atmosphere and something I’ve worked hard to be part of in the years to come,” said Campese, who joined Saints late last month. “When I ran out, the fans gave me a massive round of applause and made me feel welcome and gave me that little bit more edge to make me want to do well for them. “I played a bit of Wanderers (in the win against Sale Jets) and it’s just great to get a bit of footy under my belt.